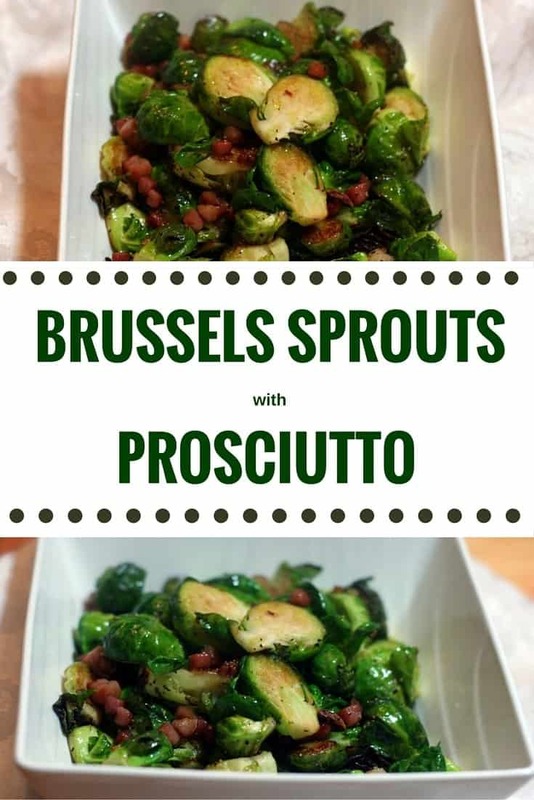 Brussels Sprouts with Prosciutto is a delicious and easy side dish that takes less than 20 minutes to prepare! A great side dish for Thanksgiving, Christmas, really any time of year! The prosciutto adds a nice depth of flavor and a crunch to the sauteed Brussels Sprouts! Brussels sprouts are one of my most favorite vegetables, ever! This dish is so easy to prepare and is truly a great dish to prepare for the Holiday Season! I love prosciutto as well so the combination is a no-brainer for me! 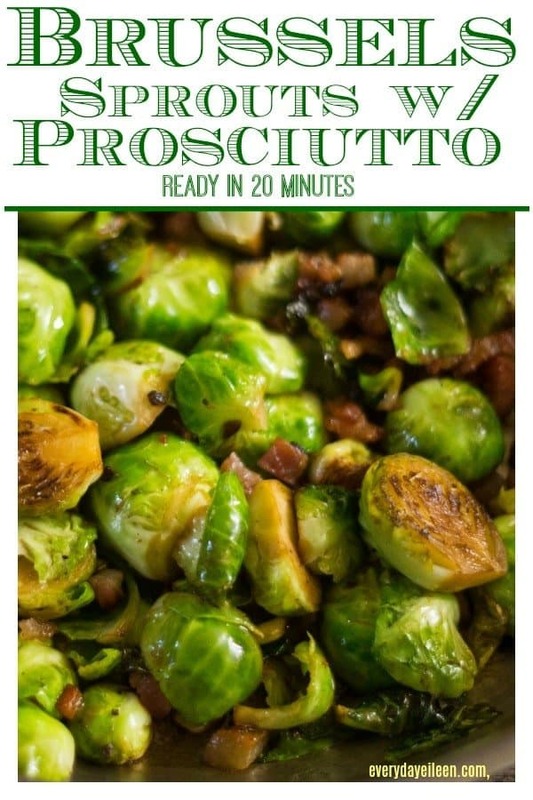 The prosciutto is browned and the Brussels Sprouts soak up extra flavor. I like to prepare this dish when family and friends come for dinner too! Sauteed Brussels Sprouts are ready in about 20 minutes. 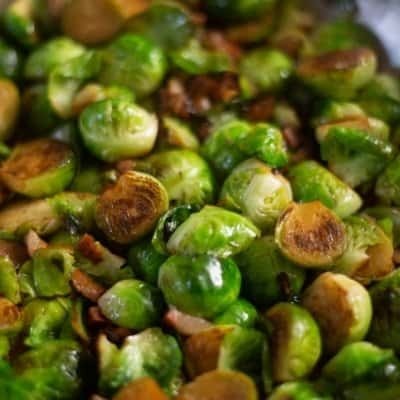 This is a great side dish to introduce people who either don’t love Brussels Sprouts. I have converted many, including my own kids to Brussels Sprouts fans with this recipe! Should Brussels Sprouts be purchased on the stalk? Brussels Sprouts are always best purchased from the stalk. It is not always possible. It is perfectly fine to purchase individual Brussels Sprout heads when stalks are unavailable. Prosciutto is an Italian ham. It is cured and dry. Bacon can be used if prosciutto is unavailable. How can uncooked Brussels Sprouts be stored? Uncooked Brussels Sprouts should be kept in the fridge in a storage bag in the veggie drawer for about 1 week. Can these Brussels Sprouts with Prosciutto be made ahead and frozen? I don’t recommend making this recipe and freezing them. The texture of the sprouts may change. This is a really easy and quick recipe so I would make fresh when ready to eat! Are Brussels Sprouts easy to grow in a garden? I grow Brussels Sprouts in my garden. They are a hearty veggie. Interested in growing Brussels Sprouts? This article is very helpful for gardeners! What are some nutritional facts about Brussels Sprouts? A full nutritional article about the health benefits of Brussels Sprouts is here. Contain Potassium, which can help lower blood pressure. All-Clad Saute Pan with Lid: A great saute pan that is sturdy and holds the heat very well. I’ve had one forever! This dish can be prepared earlier in the day and just warmed in the oven when ready to serve. Slice the brussels sprout in half so they cook fairly quickly. 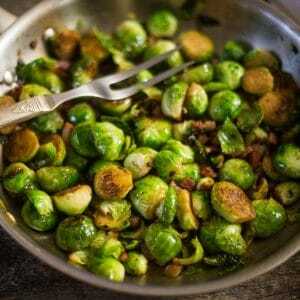 The Brussels Sprouts caramelize and develop a rich flavor. To a saucepan over medium heat add 1 teaspoon olive oil. Add in the diced prosciutto and shallots, saute about 5 minutes. Add in the garlic for the last minutes. Remove prosciutto, shallots, and garlic. Set aside. Keep about 2 teaspoons of the drippings from the prosciutto. Add in the sliced Brussels Sprouts and careful add in white wine. Saute about 9 minutes, Brussels Sprouts should be almost done. Add back in the prosciutto mixture. Original post-December 2015, most recent update November 2018. A healthy, easy side dish that will compliment almost any meal! Full of both flavor and nutrition! The prosciutto adds a smoky flavor to the Brussels Sprouts! 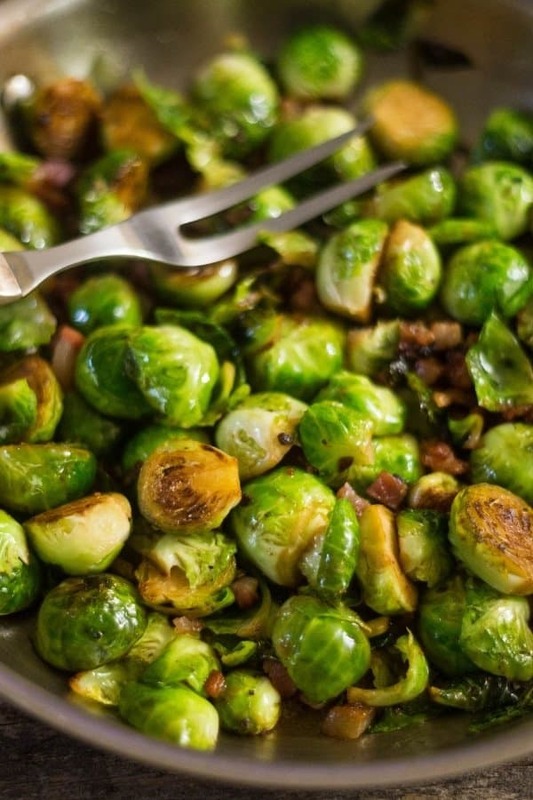 A wonderful side dish of Brussels Sprouts with crispy prosciutto, shallots, and garlic! They finish sauteing in white wine for a flavorful side dish. Sauteed Brussels Sprouts are quick and easy! A great addition to any meal, especially for the Holidays! Heat a saucepan over medium heat. Add olive oil. Add in the diced prosciutto and shallots. Saute for about 5 minutes. Stir in minced garlic. Saute for about another minute. Prosciutto should be just about cooked through. Remove the prosciutto mixture to a plate, set aside. Drain all but about 2 teaspoons of the drippings from saute pan. To the saute pan add in the Brussels Sprouts. Stir for about 2 minutes! Add in the white wine and season with black pepper. Stir occasionally about another 6 minutes. Brussels Sprouts should be almost done, a fork can enter the sprout easily. 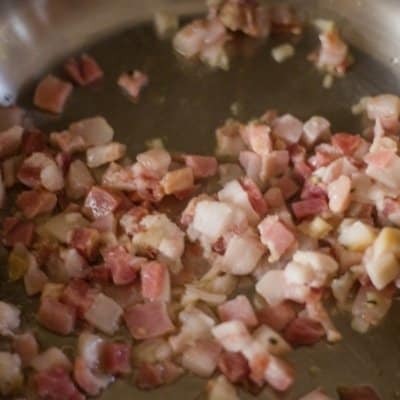 Stir in the prosciutto mixture. Saute another 2 minutes or until sprouts are cooked through. Check flavors, reseason if needed. Note 1: Feel free to swap bacon for the prosciutto. Note 2: This recipe can be made earlier in the day and reheated in the oven for a few minutes at 300 degrees. Thank you Cindy! 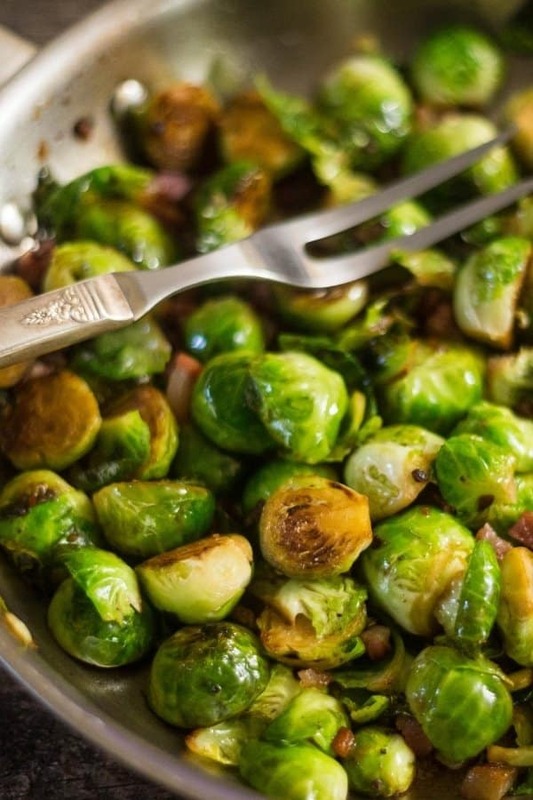 This Brussels Sprouts Recipe is delicious! Thank you Cindy! We love it too! Awesome Tommy! Happy your family liked the deviled eggs! Oh my gosh I love Brussel Sprouts! Most people either love them or hate them and I love them. This sounds like an awesome recipe and I just added it to my Yummly Recipe box! aw, thank you so much – I hope you enjoy, we love it! This looks like a fantastic side for the family! I’m a vegetarian but I love brussel sprouts! Ok this looks so amazing that I just had to pin!!! I will be trying this out for sure! That is great, glad you like it! I love Brussels sprouts! This recipe sounds absolutely delicious! I really love the presentation of this dish and the way it was prepared. They are so healthy and tasty. They really are delish and healthy, I hope you enjoy! I can’t say I’ve ever ate brussels sprouts. If the pictures represent how they should taste, I’m in for a batch and this recipe this weekend. This looks so yummy. I love that it’s easy to prepare. Yes, very easy and so tasty! That’s a great way to use the brussel sprouts. I Haven’t had any since I was a kid. I should try them again. I hope you try them again, they really are delicious! Not a big fan of Brussel Sprouts, but this looks delicious! I’m a relatively new convert to brussel sprouts, but I’m loving them. Pairing them with prosciutto is a good thing! Thank you Liz, I hope you enjoy! Awesome combination! This would be a nice addition to all the dishes served this Christmas! This will be on my table for sure! That is exactly how my husband is – hated them now he loves them! Wow this looks amazingly yummy! May have to give this a try this week. I hope you do and enjoy ! This is a tasty one! Not much of a vegetable person but this looks so delightful! I hope this recipe converts you to enjoying veggies :)! I love brussels sprouts. I roast them and add maple syrup. Maple syrup sounds delicious with brussel sprouts ! I don’t thinks I ever ate Brussels sprouts and I am clueless what is prosciutto(ham) not for me. Your recipe is doable will have to try the vegan way. That would be delicious Ana! Oh yummy! Brussels Sprouts are my all time favorite veggie.